It sounds obvious, but it's easy to overlook the fact that your bouquet is designed to be carried around all day. This means the flowers you use won't get a great deal of water, so pick blooms that won't wilt at the first sign of rough handling or hot sunshine. If you're desperate to carry more delicate flowers, make sure there's always a vase of water handy so they can be revived at regular intervals. Avoid the temptation to use a profusion of different colours, which will make things look cluttered. It is, however, fine to use different shades of the same colour - several shades of pink, for example, will produce a fantastic visual effect. Keep greenery to a minimum in your bouquet, as it's bulky to carry and you shouldn't need to flesh out the arrangement with a load of leaves.Other bouquets and arrangements on the day may require cheaper flowers to ensure you can afford several versions, but the bride's bouquet is a one-off and can thus justify a little extra expense. Here's the place to use the dearer flowers you really want to include - long-stemmed lilies, delicate lily-of-the-valley or exotic orchids. If you want to introduce an extra layer of meaning to your ceremony, pick flowers with a traditional significance. The most beloved wedding flowers, such as white roses, lilies and myrtle, stand for love and purity, while lemon blossoms floral code for fidelity. Superstitious brides can add a sprig of white heather for luck! Traditional bouquet shapes include the cascade (a drop-shaped arrangement which spills down onto the skirt), the nosegay (a neat round shape), the spray (triangular) or the pomander (a ball-shaped bunch carried dangling from a ribbon). Just like clothes, different figures will be flattered by different bouquet shapes. A round nosegay held close to the stomach probably isn't the best choice for fuller figures, so go for a trailing number that draws the eye downwards. Similarly, if you're very petite, a vast bunch of roses will all but obscure the finer details of your outfit. The cut of your dress will play a part in your choice too. Full-skirted ball gowns will be balanced by large, round or cascading arrangements, while slender column dresses look better with a simple posy. Make sure things are in keeping with the overall feel - you don't want a minimalist bouquet of lilies wrapped in a leaf if your gown's a romantic froth of lace and satin. Giving your florist a photo of the dress and a fabric sample will help them get a feel for the correct style, colours and textures. You'll definitely want to put your bouquet down at some point, so ensure there's a vase of water ready and waiting for your flowers. It's traditional to put the bridal bouquet on display at the front of the reception venue. If you fancy showing your blooms off, order an extra vase when you're sorting out your centrepieces, just to make sure the bouquet co-ordinates with the rest of the decoration. The throwing of the bouquet is something most guests keenly anticipate, but if you'd prefer not to give up your expensive flowers to the hordes waiting to catch them, consider asking your florist to prepare a separate bouquet which can be thrown instead. 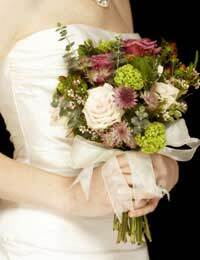 A note to grooms - it's a good idea to pay attention to the flowers used in the bride's bouquet. Recreating the flowers she held on your wedding day will win you big Brownie points when it's time to buy Valentine's presents, birthday surprises and anniversary gifts. After it's all over, why not have your bouquet preserved for posterity? Specialist companies can take your flowers and dry them to turn the bouquet into a 3D, framed work of art, so your photographs won't be the only lasting reminder of your day.